Someday not too long from now, there will be stretches of new, multi-story construction from one end of Pike/Pine’s Union Triangle backside to another. Last week, we reported on the re-start of planning to develop a mixed-use building at the site of the Undre Arms Apartments. This week, we move up the block to talk with the Polyclinic about the status of their plans to demolish the Complete Automotive building and build a new development at the corner of Union and Broadway. 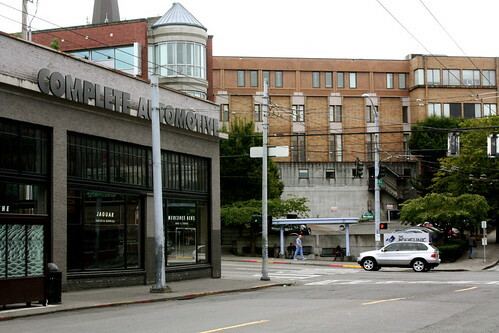 Where the 1111 East Union project that will replace the Undre Arms is full steam ahead, Polyclinic says the plans for their chunk of Union and how they will solve a space crunch at their First Hill facilities is still very much up in the air. Corgiat declined to give a specific timetable for decisions but said it was possible that Polyclinic would have a plan to share in the next year. In 2008, in need of space to build a new clinic in the area, the Polyclinic purchased the 16,000 square feet of land and the 1920 building at the corner of Broadway and Union for $6.25 million. The Polyclinic then successfully lobbied Seattle’s City Council to have their area of Union excluded from the Pike/Pine Conservation Overlay and to have rules passed that would specifically allow development of a medical building at Union and Broadway. The First Hill Highrise Zones ordinance permits construction of large medical services developments in zones like the First Hill area the Polyclinic owns. Corgiat says that even with the new ordinance in place, Polyclinic might look at First Hill for its expansion. In the past, Polyclinic officials have said their first choice for a relocated facility is property the clinic owns adjacent to the Seattle First Baptist Church at Seneca and Boylston. “If we ended up developing the different site, [the Complete Automotive Building] could be the home of future expansion or we could leave the building intact though it is not in the best condition,” Corgiat said. Corgiat also said that, of course, another option could be for the Polyclinic to flip the property to another developer if their First Hill plans end up moving forward. With the Under Arms development in motion again and Polyclinic getting closer to a decision on its future on the street, East Union’s redevelopment has the potential to get even busier. The big magenta building at 10th and East Union has had a permit in place since 2007 to move forward on the design and development process for a 5-story mixed use building that would replace the 1904 warehouse structure that currently houses a mix of businesses including the Museum of the Mysteries, a capoeira studio and, opening this weekend, the Cork House, among others. In the meantime, the Complete Automotive business joins other Capitol Hill-are auto service providers in their long, slow road trip off the Hill. After 19 years on Capitol Hill, the “luxury” automobile dealer and service center has moved its operations to South Lake Union though Corgiat says they continue as a tenant in the Union location for some of their business. Given Corgiat’s comments, it doesn’t sound like there is a need for DPD to rush on this one. Meanwhile, for as long as most of us can remember, the Polyclinic has “maintained” the triangular site where Harvard and Broadway come together as a trash-filled chain link fence-surrounded eyesore. And, meanwhile, the existing Polyclinic building faces Broadway with, what is it?, four parking garage entrances. That company has shown that it has no concern for how its development affects the neighborhood. Polyclinic says the slope of the lot is too complicated and expensive to develop (need to talk to Seattle Parks to find out what they think of the space) but we’ll have more on that weird pocket soon including its history and some of things Polyclinic says it has considered to put it to use. That triangle should be left alone. Polyclinic can build their monstrosity elsewhere. I have no reason to date to mistrust them, but this article makes me scared and dubious of Poly’s ability to execute its expansion with any neigborhood-friendly pretense. The Seneca site is abutting an historic landmark and icon of the community (Baptist), so unless its no more than four or five stories will be a huge impact. They also want auto access off of Boyleston from what I heard, which is a major Green Street opportunity and ped connection to streetcar. The automotive site is more promising, but really is a retail frontage worth saving for a more street-friendly use. The triangle site at Madison is perfect and but it appears doesn’t provide the best parking ratio to suit their needs. I hope they can expand to meet their mission, but would hope they think long and hard about what it takes to be considered a good neighbor. Tell us which site is the best and how they should use it. I like good jobs in the hood, and medical providers are a plus too. Their present building is fine, like the turret. The Polyclinic really does need some more space. (I’m a patient there.) But there are some consequences to their building plan options. If, for instance, they choose to take the land they own next to First Baptist Church, the Church will have to find a new parking lot. So there is likely some kind of discussion about a trade. The Church owns the old Minor Hospital building, which is an especially beautiful and historic building here on First Hill. Either a trade or the loss of the Church parking may well mean the end of this wonderful old brick building. (Not a dime a dozen car showroom — a very special building when it was built.) And then there’s the question of the corner (Madison, Harvard, Broadway), which has been sitting empty for decades. It belongs to the Polyclinic. It seems to me that some kind of serious discussion of the tradeoffs should be happening somewhere — and some kind of plan emerge that takes into account all the present uses and needs of the block between Madison and Union along Broadway and west to Boylston. I’m not sure whose venue it would be to do this. Maybe someone has an idea?